Emanuel & Christena Anderson House. From Wikipedia. Image taken by Werewombat on 22 Sep 2008. The Anderson House, built circa 1906, is located on Lot 30 (Tax Lot 4300) in the Cedar Creek Park Addition to Gresham. In an established residential neighborhood, the house fronts SE Roberts Avenue on the north and SE Maple Loop on the west. The house is one of the oldest residences in the neighborhood, generally characterized by Craftsman and Bungalow style dwellings, and newer single-family residences. Sited on a flat lot, the house faces north with an expansive front yard buffered from SE Roberts Avenue and SE Maple Loop by shrubs and smaller deciduous trees. Two mature black walnut trees, dating from the historic period, are in the front (north) yard. A sidewalk extends along the edge of SE Roberts Avenue and another sidewalk parallels SE Maple Loop. Deciduous trees interspersed with shrubs have been placed in the parking strip on the north side of the sidewalk; the vegetation screens the sidewalk from the street. A brick landing in a keyhole pattern is at the foot of the front stairs. A brick walkway from the west side deck leads to the driveway. A concrete driveway decorated with brick extends east from SE Maple Loop to a carport attached to the back (south) of the house. The carport has double wooden doors that simulate historic garage doors. Originally, the driveway was located along the east side of the house and was accessed from SE Roberts Avenue; a portion of the eastern side of the lot was subdivided and sold in the early 1990s. Currently, a dense arborvitae hedge screens the Anderson House from the newer dwelling on the east. A wood fence and shrubs screen the property from the residence on the south. Flowering shrubs and plants including rhododendrons, roses, and ferns are around the perimeter of the house. Plantings also frame the south and north side of the driveway, and some of the evergreen shrubs have sculpted forms. The remainder of the well-maintained yard is landscaped with perimeter plantings. A shed and gazebo are located in the yard, but due to their insubstantial size neither is counted as a resource. The one-and one-half-story Anderson House is asymmetrical in plan and measures approximately 20 feet (east-west) and 54 feet (north-south). A carport and den addition was added in the 1960s to the back (south) elevation and a newer deck built on the west side of the house. The house has a cross gable roof covered with architectural composition asphalt shingles. A small recessed porch on the upper story of the west elevation has a decorative sptndlework frieze, tapered chamfered pilasters with an "X" pattern carved in the wood, and a hip roof. In 1916 the front gable was extended to enclose this small porch. A shed roof dormer has been added to the west side of the roof. Projecting eaves embellished with a dentil fascia molding extend over the face of the building. The gable ends are decorated with king-post stickwork, and wide bands of staggered and hexagonal cut-wood shingles. Paired one-over-one double-hung wood sash windows punctuate the gable ends. The bottom of the gables flare slightly over the lower story's cut-away-bay windows. Jigsaw brackets with turned drop pendants at the comers decorate the bays on the west and north elevations. The front (north) bay has colored glass in the upper sashes. The remainder of the one-over-one, double-hung wood sash windows are surrounded by wood trim. Some of the original windows on the secondary elevations have been replaced with alternate window types. The original siding on the majority of the house consists of vertical drop wood siding finished with wide comer boards and a watertable. The second story of the rear ell is covered with wood shingles, and fire retardant shingles on the lower story. This portion of the house has smaller double-hung windows topped with a cap molding. A picture window and tall brick exterior chimney have been added to the east side of the house. Fire retardant shingles also cover the bottom portion of the west elevation bay. The house has a concrete foundation. A one-story shed roof addition was made to the rear of the house in the 1960s and a lower carport added to the shed roof extension. A deck with a turned balustrade has been added to the west elevation. This deck wraps around to the front porch. The recessed front porch has an original chamfered tapered pilaster that has a carved "X" in the wood. A turned porch post has been added to the northwest corner of the porch. Jigsaw brackets decorate the comers of the porch. Fluted trim boards, a wide projecting cornice molding with a dentil molding, and a multi-pane transom decorate the entrance. The original beaded ceiling is intact. A newer paneled door replaced the original door. New wooden stairs lead to the brick landing and the front yard. The Anderson House has two floors and a partial daylight basement. The first floor is composed of a foyer, living room (parlor), dining room, den, bathroom, utility room, kitchen, and family room. The second floor has four bedrooms and a bathroom. The entrance door opens into a small foyer that has a tall ceiling, wallpapered walls, and marble floor. The doorway on the east side of the foyer leads into the living room (parlor) that has high ceilings, wide crown molding, wide baseboards, and a molded picture rail. The colored glass windows in the bay window illuminate the room. Molded trim boards surround the windows. A wide doorway on the south elevation leads into the dining room and kitchen. The dining room has the same wide crown molding, high ceilings and baseboards, and window trim as the living room. A chair rail has been added around the room and carpeting installed over the original fir floors. A staircase on the east side of the dining room leads to the upper level. The den is also east of the dining room and has wood waincotting finished with a chair rail, a picture window on the east elevation, a closet on the north wall, and heavy cornice molding.The kitchen is open in plan. Part of the wall between the dining room and kitchen was removed to create a counter between the two rooms. The kitchen originally extended across the back of the house but was remodeled in early 1990s to incorporate a laundry room and bathroom. The kitchen has high ceilings (restored in 1990s), original trim around the doors, vinyl flooring, and new cabinets. The utility room and bathroom are at the east side of the kitchen and have vinyl floors and high ceilings. An original four-panel wood door with a pressed metal doorknob leads to the bathroom. The family room, south of the kitchen, has modem finishes and was added in the 1960s. The room has a wood stove, carpeted floors, sloped ceiling, and a French door on the west elevation. A stairway with a turned railing leads to the back door and to the unfinished basement that has concrete walls and floor, and an original root cellar. high ceilings and baseboards, and carpeting over the fir floors. Original four-panel wood doors with pressed metal hardware lead into the bedrooms. The north, east, and west bedrooms have picture rails, carpeted fir floors, sloped ceilings, original window trim, and high baseboards. A door on the north side of the west bedroom opens onto a small porch that has a turned spindle frieze, cut-wood shingle siding on the east elevation, and a closet on the north elevation with tongue and groove siding on the outside, and flush-board interior walls. The bedroom at the south end of the hall was added in the 1960s, and has a sloped ceiling and newer trim. The upstairs bathroom, on the west side of the hall, has an original comer sink, a comer cabinet, high ceilings and baseboards, and a vinyl floor. Extended the pitch on the west side of the north gable to partially enclose small upper porch; 1916. Exterior chimney added to the east elevation (ca. 1960). Shed roof carport and den built on the rear (south) elevation (ca. 1960). Fire retardant shingles and some newer windows added to rear portion of building (ca. 1960s). New front door and gutters (early 1990s). A deck and turned railing added to the west and part of north elevation (early 1993). Crown molding added to living room and dining room (early 1990s). Kitchen remodeled and downstairs bath and utility room added (early 1990s). Restored original ceiling heights in the house (early 1990s). listed in the Gresham Historic Inventory remaining near the historic urban core. The Anderson House displays characteristics of the style in its multiple roof forms, decorative cut shingles, cut-away bays, colored glass windows, small upper story porch, turned spindle porch friezes, asymmetrical massing, and setting. The period of significance dates from 1906 to 1919. The beginning date of 1906 represents the Andersons' arrival in Gresham and the construction of the family house, and the end date of 1919 corresponds to Emanuel Anderson's move from the house. The themes of community development and architecture are represented in the nomination. for employment. After the war, the area continued to grow at a steady pace until the 1970s, when Gresham experienced a period of phenomenal growth, tripling its population in a decade. A service-oriented community and the eastern hub of Portland, Gresham is currently is the fourth largest city in Oregon. Emanuel and Christina Anderson built their SE Roberts Avenue residence circa 1906 after visiting family members in the area. Bom on August 1,1855 in Sweden, Emanuel came to the United States in 1869 and settled in Buckland, Missouri, where he married Christina Kjersti Onsdorff on February 21,1875. The couple settled on a section of land, established a successful turkey and pig farming business, and began raising their six children. The three Anderson sons moved to the West Coast in 1902,1904, and 1905, leaving their parents on their family farm in Missouri. Sons Edward and Carl Anderson became builders, constructing many commercial structures in Portland, and Julius became a professional photographer settling in Vancouver, Washington. Emanuel and Christina had three daughters. One daughter was married to a minister who was working at a Lutheran college, another daughter was living in Portland, and their youngest daughter was still at home. In 1905, the Andersons and their youngest daughter Emlie visited their son Julius in Vancouver, Washington. While on their trip, the Andersons decided to move to the West Coast and chose Gresham, Oregon for their new residence. By this time, Emanuel Anderson had retired from farming, was financially independent, and was able to move easily to be near his children. The 1905 Lewis and Clark Exposition in Portland attracted visitors from all over the country, and many of the travelers later moved to Oregon. According to Ariene Henshaw, granddaughter of the Andersons, the family bought six acres in 1906 on SE Roberts Avenue and hired builder Charles Emil Witter to construct a house on the site. The property was approximately one and a half miles south of Gresham's business district along SE Roberts Avenue. The Andersen's new house faced north on a flat lot and was set back from the street. The back of the property was adjacent to the Oregon Water and Power Company Railway commuter and freight railroad line that connected Gresham with Portland and beyond. This offered a convenient mode of transportation. Gresham grew during this period: the town of Gresham was incorporated in 1904; the first paper was established the same year; the telephone company organized, Grange Fair started, a brick yard began producing in 1906; and the electric company was founded in 1908. After making arrangements to build their new house, the Anderson family returned to Missouri. In April 1906 the family moved permanently to Gresham and into the completed house on SE Roberts Avenue. The Andersons joined the other families who had become successful business people and had moved to Gresham after building their retirement homes. A religious man, Emanuel was devoted to the Lutheran Church and the betterment of people's lives. The family were members of the Saron Lutheran Church located east of Gresham near the intersection of Powell and Bames Roads (the congregation later moved closer to town and currently is known as the Trinity Lutheran Church). According to granddaughter Ariene Henshaw, Anderson was a "gentleman farmer" who kept a garden on his acreage on SE Roberts Avenue. Anderson also demonstrated his keen business sense well into his retirement. Several family members received aid from Anderson when they wanted to start their careers and businesses in the Portland/Gresham area. Anderson helped his brother-in-law establish a harness shop on Main Street in Gresham's business district.Lutheran institution in Portland. He served as a hospital board member until 1926. Upon his death, the Gresham Outlook newspaper reported, "the upbuilding of this institution (Emanuel Hospital), of which Portland is justly proud, has been one of the fond projects which filled the life of Mr. Anderson." According to Anderson family lore, Emanuel Hospital was named after Emanuel Anderson. Anderson also helped establish the Bank of Gresham in 1910 and for many years served as a board member of the bank. The Andersen's sons, Edward and Carl, erected a new home for their parents on fifty acres in the Pleasant Home district south of Corbett, Oregon. Emanuel and Christina Anderson sold their home on SE Roberts Avenue in 1919, and moved into their new residence where they lived until Emanuel Andersen's death in 1928. The Andersons purchased the SE Roberts Avenue property in 1906 from Alfred J. and Grace A. Stout. The Andersons sold the property in 1919 to Michael J. and Ellen B. Byme who owned the acreage until 1920. Subsequent owners include: Glad (1920), Winter (1920 to 1921), Blonn (1921 to 1947), Kirkpatrick (1947 to 1949), Cooper (1949 to 1953), Van Beek (1953 to 1971), Strey (1971 to 1975), Stallard (1975 to 1986), Carman (1986 to 1991) Bachhuber and McGee (1991 to 1993), and Hartner and Caldwell (1993). The current owner, Kay Caldwell, purchased the property from Mr. Hartner in 1993. Bernard Emil Witter was bom in Saxon, Germany on May 26,1845. He came to the United States with his parents when he was four years old. Bernard was naturalized on October 18,1866, in Columbus Ohio. He married Barbara Katherine Schoepfel in Cincinnati two years later. They had four children* that survived to adulthood: Louise Susan, Charles George, Ida May and Arthur Bernard. In 1888 Bernard moved his family to Oregon after his son Charles visited cousins in the area and sent favorable reports back to his father. Bernard purchased a 105-acre farm one mile south of Gresham. Here they set about building their family home and farm buildings in preparation for a farming venture. The cousins who had encouraged them to come to Oregon were the Stones (of Fairview) and the Jacob Zimmermans. The Zimmermans built the home at 179th and Sandy (also on the National Register of Historic Places). 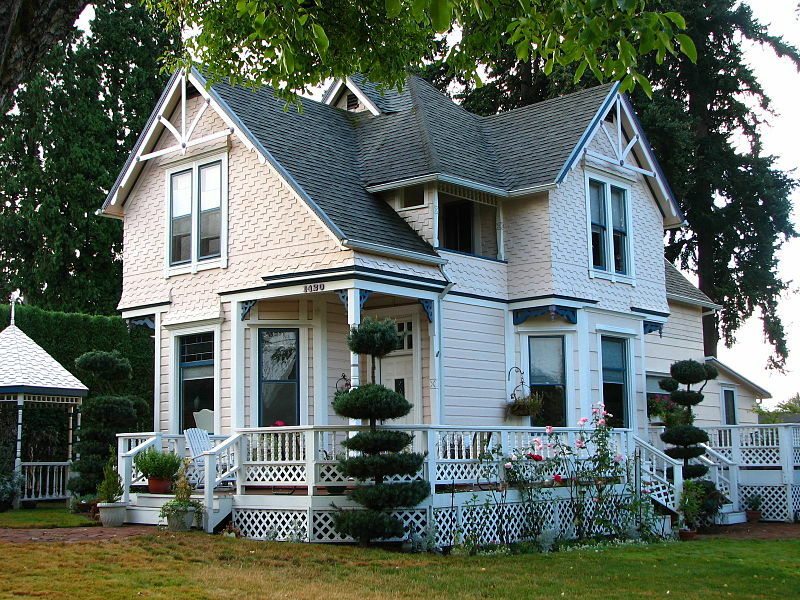 Bernard Emil Witter's family home was built in about 1890 and is located at 938 SE Roberts. It is presumed that he did most of the building with the help of his sons. Bernard's son Charles Emil Witter became known as a carpenter and built several houses in the area, and throughout Gresham. Bernard's other son, Arthur, became known as the farmer in the family and inherited the 105-acre farm after his father's death. Over time, Charlie built homes on this land. The Arthur B. Witter house, was built by Charlie in 1914 on part of the original 105-acre farmland. It is located at 909 SE Roberts, across from the original Bernard Witter family home. The Witters built, and lived in, many homes in the immediate area. Charles Writer's house is located at 1102 SE Roberts Avenue, and was finished in 1921. Members of the Witter family lived in three homes built around the intersection of 9th and Roberts. It is believed that Charlie built these homes as well. Only recently did Charlie's son, Clarence, have to move from one of these homes due to old age. The Anderson House, located at 1420 SE Roberts, was built in 1906 by Charles Emil Witter.